We all know how the story goes. Google has become the number 1 Internet destination in the U.S. without doing any consumer advertising. 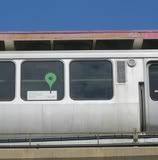 I recently spotted this ad for Google Maps on a Chicago Transit Authority train. It’s hard to see in the picture here but that little green pushpin icon should be familiar to frequent Google Maps users. A few weeks ago, I called out Google for toggling back and forth between positioning itself as a direct response marketing vehicle and a branding platform. In a tough economic climate, Google is sticking its flag in the sand as a DR tool that should be the last dollar cut from the marketing budget. Whereas, a few short quarters ago, it was spreading the gospel about the power of search and Google for brand advertisers. Not sure what to make of the recent push to promote the Google brand and if this means they are back on the branding train (pun intended). Maybe they’re just looking to capitalize on a distracted Microhoo by building share for its local search product. Either way, I find it quite ironic that the champion of measurable, accountable, and actionable media is buying ads on train cars. I wonder what their click-through rate is on those placements?